We are so excited to announce the final two keynotes in our stellar main stage line up for NDF2018. He mihi kau ana ki a Tahu Kukutai, Professor of Demography at University of Waikato, kōrua ko Shaun Angeles Penangke, Artwe-kenhe (Men’s) Collection Researcher at the Strehlow Research Centre, Museum and Art Gallery of the Northern Territory. Tahu (Ngāti Tiipa, Ngāti Kinohaku, Te Aupōuri) specialises in demography that is critically informed and grounded in indigenous perspectives and aspirations. She is also a founding member of the Te Mana Raraunga Māori Data Sovereignty Network who advocate for Māori rights and interests in data to be protected as the world moves into an increasingly open data environment. Shaun is a Kungarakany and Arrernte man who grew up in the central desert lands of his mother in Mparntwe, Alice Springs. As Artwe-kenhe (Men’s) Collection Researcher at the Strehlow Research Centre he manages a highly restricted collection of Central Australian Aboriginal men’s cultural heritage material consisting of sacred artefacts, archival documents, genealogies, and a digitised catalogue of ceremonial film and song recordings. Tahu and Shaun bring expertise, experiences and world views that we are confident will educate, challenge and enlighten all of us. We so look forward to learning from each of them, along with Tuaratini, Tara Robertson, Bergis Jules, Michael Edson. Professor Tahu Kukutai, National Institute of Demographic and Economic Analysis, University of Waikato. Tahu Kukutai (Ngāti Tiipa, Ngāti Kinohaku, Te Aupōuri) is Professor of Demography at the National Institute of Demographic and Economic Analysis, University of Waikato. Tahu (@thkukutai) specialises in Māori and indigenous demographic research and has written extensively on issues of Māori population change, Māori identity and official statistics. Tahu is a founding member of the Māori Data Sovereignty Network Te Mana Raraunga and co-edited (with John Taylor) Indigenous Data Sovereignty: Toward an Agenda (free download: https://press.anu.edu.au). Tahu has degrees in History, Demography and Sociology from the University of Waikato and Stanford University. She was previously a journalist. Shaun is the Artwe-kenhe (Men’s) Collection Researcher at the Strehlow Research Centre, Museum and Art Gallery of the Northern Territory, and has worked in this capacity for the past five years with a very important and highly restricted collection of Central Australian Aboriginal men’s cultural heritage material consisting of sacred artefacts, archival documents, genealogies, and a digitised catalogue of ceremonial film and song recordings. This role involves complexed research that relies upon the continuous engagement and consultation with highly knowledgeable senior Aboriginal Elders who are imperative to the wellbeing of this significant collection. He is currently completing a Masters of Research at the University of Western Sydney with a thesis based on the significant contributions of the Akngerrepate (senior Elders) who not only informed TGH Strehlow’s research, but were effectively the co-creators of this important body of ancestral cultural knowledge. Shaun is a member of the Indigenous Repatriation Program National Advisory Committee and is a passionate advocate of indigenous governance and agency within cultural heritage collections. Tuaratini is a Takitua - a Storyteller. From a young age, the Auckland born Cook Islander was fascinated with myths and legends. She learned that pacific history was riddled with incredible stories of gods and goddesses, that became one with the sea, land and sky – and so she says, she was hooked – and her pacific storytelling journey began. Tuaratini is currently the Project Manager at the Pacifica Arts Centre in west Auckland and facilitates varying arts, community, and education programmes. She performs as the Pacifica Experience official Storyteller, and is the senior tutor of the programme’s Music, Drums & Dance workshop. Her background is in media communications, where she worked in pan pacific broadcasting as a journalist, producer, and announcer. 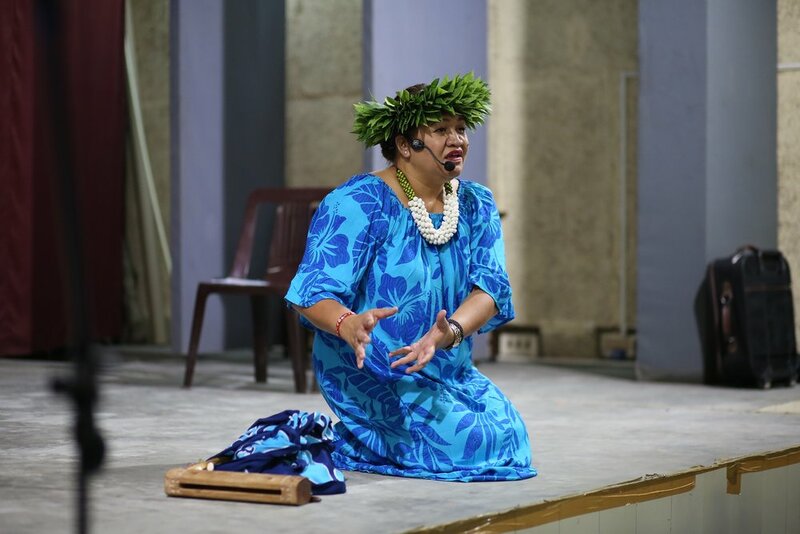 She has featured in various televised works addressing pacific culture, both as the subject and as a presenter, and has gone on to support several community initiatives as a communications consultant. Ten years ago Tuaratini began focusing on the preservation and documentation of pacific cultural arts and practices, through the recording of oral histories and the performance of, song, chant, prayer and legends of the Cook Islands. She regularly performs pacific storytelling at schools, festivals, libraries, and arts events around NZ. And in 2017 and 2018 she was invited to provide storytelling workshops and performances to groups and festivals around India. In 2017 Tuaratini co-founded the Turou Takitua Storytelling Network, a group dedicated to the growth and development of Cook Islands storytelling in Aotearoa. She continues to develop her practice through research and engagement with other practitioners and knowledge holders, and is working closely with Pacific communities to encourage the revitalization of the storytelling styles of the Pacific. Bergis Jules (@bergisjules) is the Director of Equity Initiatives at Shift Design Inc and the Project Director for Documenting the Now, a project which seeks to develop tools and practices that support the ethical collection, use, and access to archival content generated from the web and social media. The work of Documenting the Now was initially developed in 2014 to support archiving of the protests and activism that took place in Ferguson, Missouri after the murder of Michael Brown, and as those activities played out on social media. Jules’ work also involves helping community-based archives, especially those documenting the lives of marginalized people, to build capacity and achieve long-term sustainability. He is passionate about helping these vital cultural heritage spaces continue to exist independently and as legitimate sites where historical inquiry can take place. Jules' previous community-based archives work includes leading programs at the Black Metropolis Research Consortium, developing the D.C. Africana Archives Project, and helping to lead the Diversifying the Digital Historical Record national forums. He received an M.A. in Library and Information Science and an M.A. in African American and African Diaspora Studies from Indiana University. He is currently a doctoral student in the Public History program at the University of California, Riverside where his research focuses on representations of African Americans in web archives.